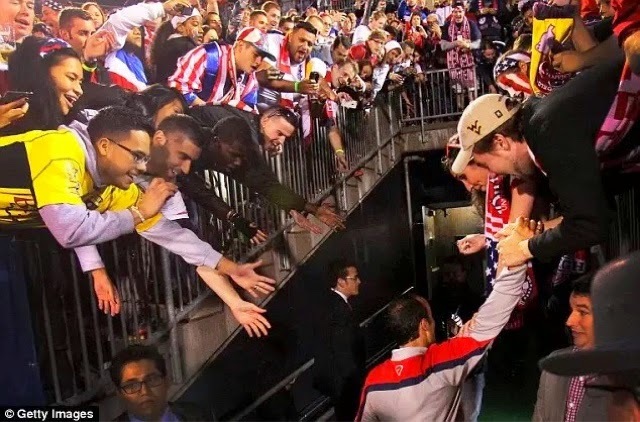 Landon Donovan played his last match for the U.S. Men's national team tonight in a game versus Ecuador in East Hartford, Connecticut. He didn't score but sure got close. There was spectacle while he was on the pitch and his teammates wanted it for him. Altidore served Donovan the perfect ball and he Landon struck it well. The post, however, disagreed. The rest of us, all of us, wanted it for him. But Landon gave us so many goals already with the national team. 57 of them, actually. Some were expected, some spectacular, some made us dream, some made us cry. There was the second goal in the 2-0 versus Mexico in 2002 and a passage to the quarterfinals. There was also the goal versus Mexico that clinched the qualification to Brazil 2014. And, of course, the goals versus Slovenia and Algeria in 2010. Donovan's goal versus Algeria encapsulated what it is to be an American soccer player. The goal started from the bottom up, from Tim Howard's pass, to teamwork between Altidore and Dempsey, to Donovan's sublime final touch off a rebound. It was meant to be and it was meant to be dramatic. Americans love drama and Donovan wrote us the script. Andres Cantor put it well during his narration of the goal. The goal was and had to be scored by America's franchise player. Tonight we say goodbye to his presence on the pitch for the USMNT. True, he was missing at the World Cup and it would have been nicer for his career to end with another tournament. And yet, in the end, Landon chooses his own path, as he did by staying in MLS and foregoing a career in Europe. He knew it was his time to end this journey. Landon chose to say goodbye at 32 with his head held high, still scoring, still smiling, still dreaming. Thank you, Landon, for helping us dream of soccer. Couldn't you have used your sway with Ecuador to have them let him put one in for old time sakes?